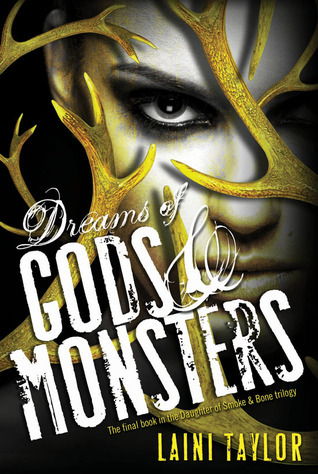 Reading Dreams of Gods & Monsters, by Laini Taylor was bitter-sweet. Bitter because this is the last book of the trilogy -- no more Eretz, Prague, Karou, Akiva, Mik, Zuzana, Kiri, Liraz. Sweet because these books are SO FREAKING AMAZING. Seriously, I love them, and this last installment was no exception. First, of course, is the writing itself. Laini Taylor's writing is evocative and poetic and beautiful, fitting of a story that is part fairy tale, part love story, and part action-war story. Then there are the characters - these characters go through so much physically and emotionally throughout the books, and Dreams of Gods & Monsters is no exception. They're making hard decisions, trying to bring together centuries-long mortal enemies, trying to forge a new future, learning to move forward, forgive, love. Some characters are wrestling with anger or guilt or despair. There are new players in this book, as nuanced and fleshed out as those characters we've come to know and love, even those characters whose role is a short -- but in no way minor -- one (fake Grandma, I'm looking at you). (And I want to just say that Morgan Toth has taken a place on my top-10 list of characters I want to punch in the face repeatedly. Gah. That guy.). Last, but not least, there is the story itself. These three books really feel like one long story - each piece building on the last, revealing more and more. What starts out as a simple story of star-crossed lovers becomes something epic and world-changing. There's a sense of looking at a map: in the first book, you're zoomed in on one spot on the map, and at the end of the book you've realized you're looking at a bigger map than you thought. Then in the second book, you zoom out a little more. And in the third -- holy cow! Apparently the map is ten times bigger than you thought it was at the beginning of the first book. I loved the big picture part of Dreams. I'm not going to say much so as not to ruin it, but it's definitely an epic-scale map we're looking at. Despite the fact that I could certainly read more in this world, the ending was satisfying because it was an end to the story we started out with -- "Once upon a time, an angel and a devil fell in love." It was satisfying, because we know that despite getting our ending, life in this world is moving forward, going on. It's AN ending, but not THE ending. For the most part, I thoroughly enjoyed Where'd You Go, Bernadette, by Maria Semple. As the book opens, we discover that Bernadette disappeared. Through emails, notes, and letters -- with a little clarifying narration dropped in from time to time by Bernadette's 8th grade daughter -- we read Bernadette's story. What happened that made Bernadette disappear? How did she get to that point? And where did she go? Readers are given various facts, and left to read between the lines. I think the format really worked for the story, because it leaves so much interpretation up to the reader. Because each piece of the story is written from the single, unique perspective of one of the characters, we often think we know something, but then realize maybe we don't know as much as we think we do. It's a great way to illustrate that one person's perspective doesn't necessarily tell the whole truth of a situation. The book manages to be satirical and snarky and sarcastic, but sympathetic at the same time. I've read reviews from readers who thought that the book trivializes mental illness, and while I do think the edge of the humor walks a fine line, the story taken as a whole actually points out the importance of acknowledging and confronting mental illness, and the damage it can do to the families and friends. I think this book also does a good job in bringing out the humanity in each of the characters. Everyone kind of starts out crazy -- but over the course of the book, everyone grows a little, and starts looking around them instead of being wrapped up in their own drama. My only complaint with the book is the ending. To me, the ending felt rushed and even a little abrupt. I would have liked another chapter or two to flesh it out. But overall, a book I enjoyed. It would make a great book club pick. 1. There is so much great character development in this book, in major and minor characters alike. At the beginning of the book I continued to want to just smack Shallan frequently, but by the end I wanted to high-five her and cheer "you go girl!" Same goes for Kaladin. But we also get so much more from people like Adolin, Renarin, Szeth, Moash, Sadeas, even Elhokar. 2. The mysteries just keep getting deeper. Just as I think I'm starting to figure something out, I realize there's a whole other layer to what's going on. Part worldbuilding and part story-telling...100% awesome. 3. Backstory! Previously, we were treated to Kaladin's personal history. In this installment, we get to see into Shallan's past and holy moly -- that girl's family is SERIOUSLY MESSED UP. It's no wonder girl spends most of the book with an epic case of if-I-just-ignore-it-then-it-never-happened. 4. Broader points of view. We get to see into the heads of Szeth and the Parshendi and Sadeas. These are not necessarily happy places to be, but are quite enlightening and add to the whole layer upon layer storytelling. 5. Resolution + Questions + Surprises. There are several good twists and surprises in this book. My husband's got the best poker face, since he finished first and then got to listen and nod as I'd talk about the book while reading it. Never gave anything away. 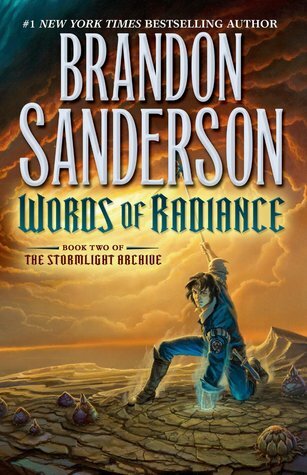 Sanderson also does a great job of giving readers some payout on what was set up in the first book -- some secrets come to light, some people have epiphanies, and we get more than one epic showdown of some kind. But, like any good series installment, we're also left with more questions, and plenty of foreshadowing (and foreboding -- things are about to get real in Roshar). I have been known to read a book in the following order: beginning, end, middle. 1. The plot of a book is interesting enough that I want to know what happens, but the writing or characters or setting or all of the above is boring/terrible/annoying enough that I don’t really care to see HOW it happens. In this case, I’ll skip or skim to the end, close the book, and call it a day. 2. I just get impatient – this applies to life, generally. I open mail on the walk between mailbox and house. I like to open presents as soon as I get them instead of waiting for the event. I’m a sloppy dishwasher because I just want to be done with it already (so I can read my book, obviously). I don’t like to read directions (I actually kind of prefer those picture-only directions). When I just get impatient and the book is good, I satisfy my curiosity…and then I’ll savor the journey. Full disclosure: impatient skipping ahead may or may not happen most often when I’ve stayed up reading until 2 a.m. and have to get up at dark-thirty to go to work the next day. 3. Sometimes, I skip ahead because a book is just plain STRESSING ME OUT (I’m looking at you Chaos Walking) and I need to find out what happens before my brain explodes. There’s nothing inherently wrong with skipping ahead in a book. I’m a pretty relaxed reader and try not to impose my personal reading rules on anyone else. But I’ve recognized that I really do prefer to read a book in the “traditional” way – start to finish, beginning, middle, end – because there really is a whole other level of satisfaction to be found in the journey, not just the destination (unless it’s a crap book – see #1). Of course, that’s just my opinion. I might think that skimming through Emma doesn’t really allow a reader to fully appreciate or get as much out of the book, but if that’s how you enjoy (or don’t) reading it – whatever floats your boat. So what about you? Do you ever skip ahead? Read the end of a book first?